The gorgeous Monsieur Gagnaire is one of those men who captivate the room by just being themselves. Just a minute with him and you feel that he is such a fascinating man. On the day of our visit, chef Pierre Gagnaire came out in the dining room quite early and greeted every single person in the room. He kneeled modestly next to us in order for us to take the picture we wanted with him and we told him how wonderful the experience was. 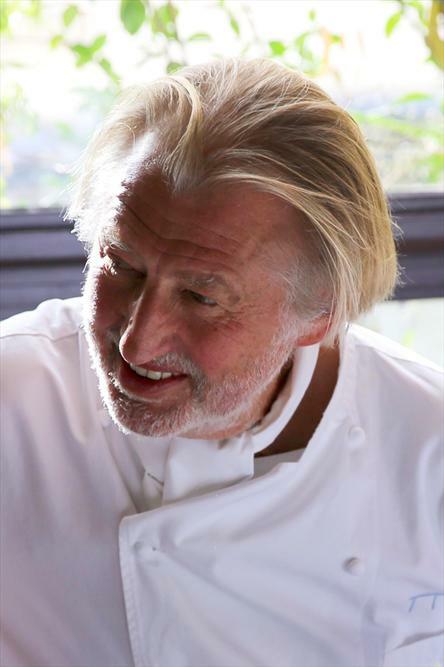 He seemed very appreciative of the comments and we chatted a little with him about his restaurant, Pierre Gagnaire. With his fusion techniques, he is one of few daring professionals who took classic French, fine dining to a new adventurous level. He knows how to play with textures and appearances while combining complex flavors in every single dish. And he is quite successful at taking his work all over the world. He runs restaurants in Tokyo, London, Dubai, Seoul, Moscow, Berlin and Las Vegas, to name a few!